Amani Jabril is in Lebanon, teaching and performing in the Amani Oriental Festival in Beirut. Though the festival is named for the Lebanese dancer Amani, we know our Amani will raq their socks off over there! This weekend, Beats Antique will be playing in Athens as part of the Wild Rumpus Halloween Bash at the Georgia Theater. In the workshop I took with Zoe a few weeks ago, she said she's really excited about this show because "It's a giant Halloween party!" There's also a Wild Rumpus street party and parade... obviously, lots of fun to be had in Athens this Saturday night! New classes are popping up all over, including several "Belly Dance Cardio" classes (do I sense a trend?). You can focus on fitness while working on your shimmies with Kumari on Sundays at 1:00 p.m. at Dance 101, with Oracle at LA Fitness and other locations (see the Jahara Phoenix site for details), and with Lacy Perry or Isis at Amoora Dance & Fitness. In case you haven't heard, the one and only Majda Anwar of Awalim is now teaching at Dance 101! Teejei paved the way for tribal belly dance at this studio, and Majda has taken the reins with two classes every Monday night. Majda has been teaching at Georgia Tech for several years, but now everyone can have the privilege of studying with one of metro Atlanta's true "raqs stars!" At 7:00, it's Discover Belly Dance. Dance 101's structure includes a variety of "Discover," or beginner classes. Majda's contribution will introduce students to the fundamentals of the form. Then at 8:00, more experiences students can experience Majda's new "Killer Drills" class. This class includes conditioning, then a series of traveling drills with layered movement, plus finger cymbals in various rhythms. Majda's goal is to challenge dancers to discover new things about how their bodies work and devote attention to the muscularity and body mechanics that make movement more efficient and allow for easier layering. Students are encouraged to work at their own pace and modify the movements as needed, while also stretching their capabilities. If you want to take your dance to the next level, come and check out Majda's new classes! Dance 101 is an beautiful, all-adult studio located in Loehmann's Plaza at Briarcliff and North Druid Hills. They offer a variety of very reasonable payment options. Hope to see you there! A week from Friday (or as they say in the South, Friday-week), Najm al Raks, a weekend of workshops and shows produced by Black Orchid Danse, will be underway! The truly amazing Cambodian-Canadian Nath Keo and Brazil's Hayat el Helwa will be teaching and performing. Don't miss your chance to experience these talented folks! RSVP to the Facebook event for more info. 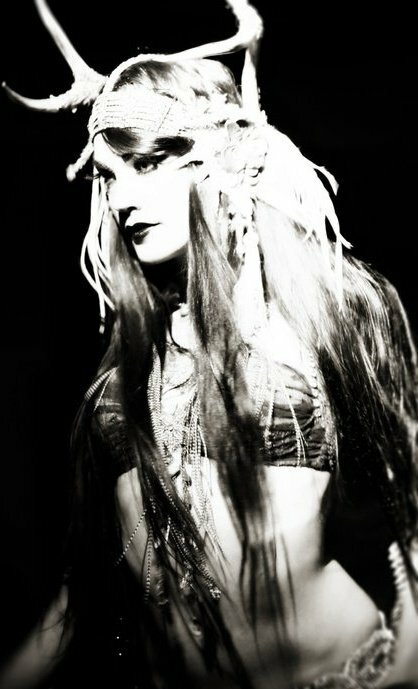 I've been a student of belly dance for seven and a half years, with at least half a dozen teachers. I've been very closely tied to several of them. I've been in a student troupe, I've switched styles and felt like I was starting from scratch, and I've "broken up" with teachers. So if you're a beginning or casual student, here's what I've learned about being a good student and getting the most of out the investment you make in classes. Don't be afraid to talk and ask questions. If you've been in classes with me, you know that I probably do this to a fault. But here are a few reasons to speak up in class (though not to the point of being disruptive, of course -- you will quickly get a read from your teacher on how much she likes to chat): first, there is knowledge to be gained by the whole class that your teachers may only share in response to questions. If you ask for something to be broken down in more detail or more slowly, chances are very good that someone else in the class was hoping someone would ask. Second -- especially when it comes to music, culture, and history -- if you test out your knowledge with a question you will sometimes find out that you're wrong, but at least you'll learn. 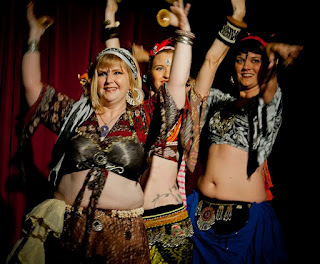 Finally, in case you haven't noticed yet, belly dancers are often very bright and witty, and you can get into the most hilarious, entertaining conversations you've ever had in a belly dance class or troupe practice session. But again... try not to be disruptive. Be respectful. Support your teacher. Be loyal to her (or him). If you believe in what she's doing (and if you don't why are you in her class? ), help her build her business. Being a professional dancer and teacher is hard, especially with the economy in its current state. If your teacher asks for someone to hand out flyers, work the door at a show, share an event on Facebook, sell raffle tickets -- whatever -- you should help. You will grow closer to your teacher, learn more about the business of belly dance, and help keep the very classes you are attending continuing and, with any luck, growing. Go out and see belly dancers performing. I can't stress the importance of this to beginner students enough. I'll never forget the first time I went to Nicola's, after I'd only been a student for a few months. As soon as one of my teachers came out to perform, everything clicked -- this was what I was learning to do! 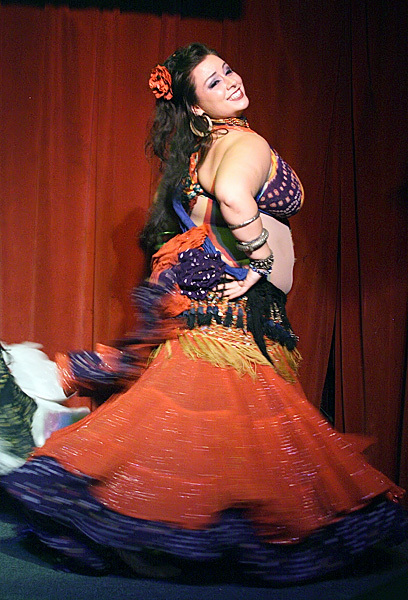 There is a healthy belly dance scene in Atlanta, whether you buy tickets for a show or just go out to Nicola's, Taverna Plaka, Messina's, Fanoos, Cafe Istanbul, or one of the many other local venues where dancers perform. I highly recommend Nicola's on the weekends; it's a casual, friendly atmosphere, the food is tasty and inexpensive, and you get to watch Nicola dance as well! Another reason to go out is to get a taste of the cultures that are the origins of belly dance. 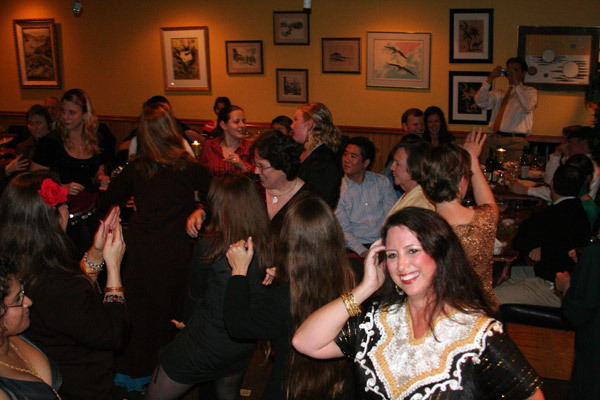 After 11:00 p.m. at Plaka, you'll be dancing on the tables to the latest Arab pop hits, and after a few hours you may get to see some traditional Greek dancing on the napkin-covered floor. At Cafe Istanbul, you can join the Turkish waiters in a traditional line dance around the floor. And of course you'll learn to Debke at Nicola's... if you're lucky, there will be a cute Lebanese guy at the head of the line, twirling a napkin! If you get the chance to perform with the student troupe, do it. I was in an invitation-based student troupe for several years, and it was hard work, but very rewarding. Participating in a more casual student troupe is a wonderful way to have the experience of performing, in a fairly low-pressure environment. You will get closer to your fellow students and can make strong friendships. You'll learn about costuming, makeup, and how to behave professionally and represent the art form. You'll get extra volunteer instruction time from your teacher, who is most likely taking some of her own free time to help with rehearsals (and don't forget to thank her for that!). And best of all, you get to perform in front of an audience -- which is not only a skill in itself, but also pretty much the point of the whole art form, right? I could go on... but some things are obvious. Practice. Watch videos. Go to workshops. Explore music. Try other teachers. Above all, learn about the culture and the art form you are representing. Belly dance is so rich and full of things to learn, I can't imagine not being a student -- in one way or another -- for the rest of my life.